This post is brought to you by Hive presented by Centrica Connected Home. All opinions belong to Thrift Diving. It doesn’t feel very much like Christmas this year. 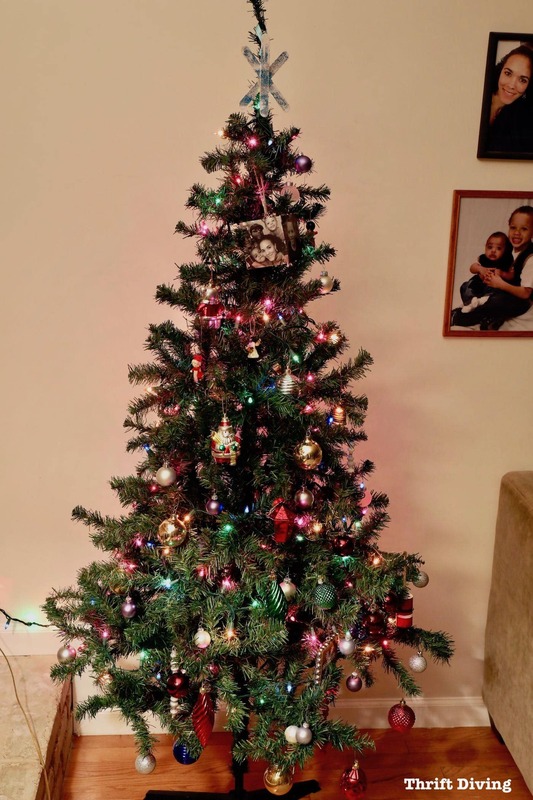 In fact, hubby scoffs every year I mention putting up a tree (he grew up with never having a tree, but it was an annual ritual in my childhood home). But this is a time of year the kids and I absolutely adore; it feels warm and cozy, and “family time” takes center stage. We often sport a “Charlie Brown tree”–a pathetic hand-me-down from my mom years ago that just can’t seem to get rid of. Each year I ponder buying a real tree, with real decorations that didn’t come from the thrift store. Yet the kids chime in about how real trees are a “waste of money” and that they like our little Charlie Brown tree. So each year, it goes up, and I vow I’ll do better next year (we don’t even have a tree skirt–gasp!). But regardless how “Charlie Brownish” our tree is, we typically love the holidays! 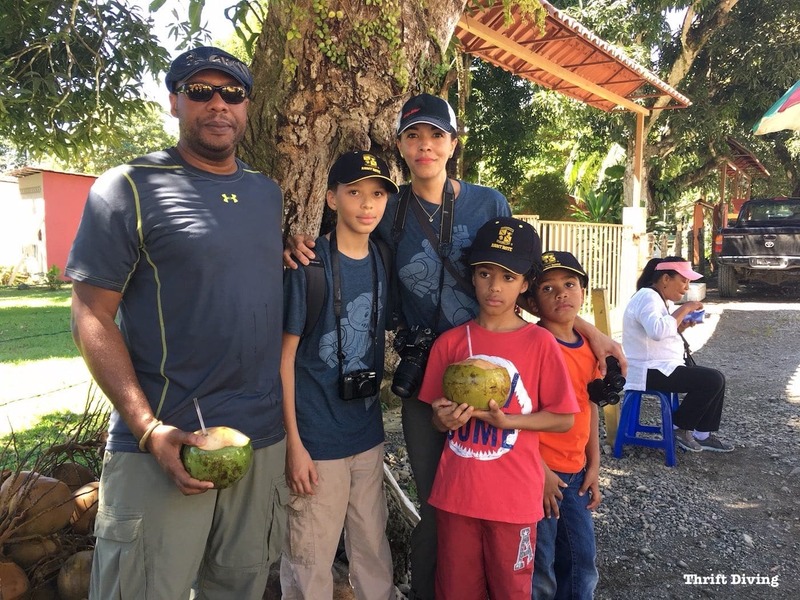 This year has been a little more challenging to get into the spirit, though, since we just came back from nearly a week-long family vacation to Costa Rica (I celebrated my 40th birthday day, and my middle son turned 8 while there, as well). When it’s 85-degrees, lush, and vibrant, it’s hard to think of Frosty the Snowman, St. Nick, and Christmas lights! HA! And we weren’t sure what we were coming back to since we hadn’t asked anyone to watch the house for us. We’d hoped all of our mail and any packages were still intact…that there was no random flooding…and that the house hadn’t been burglarized (who’d want to steal all my thrifted furniture, anyway??). 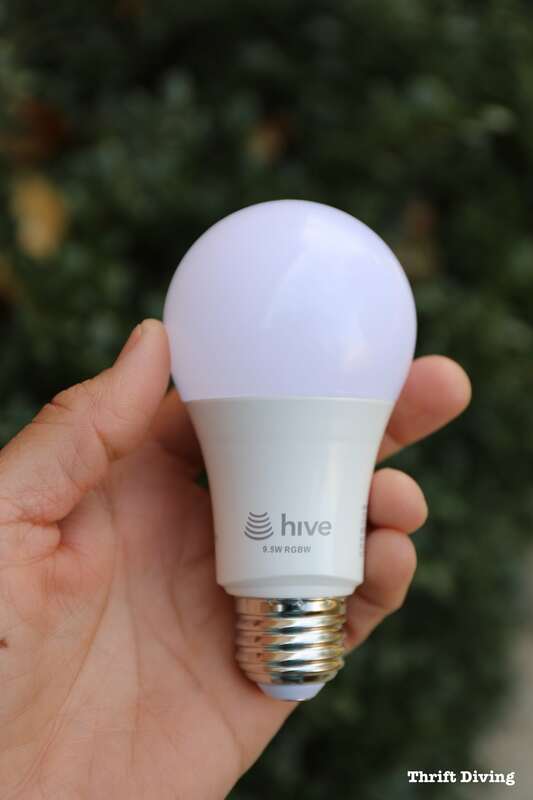 If you recall, in my last post about Hive smart products months ago, I made over a lamp in my family room and put in a new Hive Active Light smart bulb that allowed me to schedule it on a timer and manage it with the Hive app. That light is scheduled to come on from 4 p.m. – 9:30 p.m. daily. So, thankfully, despite us not being home, it still looked like we were home! Anyhow, walking into the front door when we came home this weekend, we were greeted by that light from the family room. In all the travel rush, I forgot that our Hive Active Light was automatically scheduled to be on! As much as we loved Costa Rica, it felt good coming home to familiar surroundings, especially when it was was well-lit (plus, it felt safer than coming home to a dark house). Now that we’ve been settling in for the last couple of days, the kids and I been trying to get into the Christmas spirit by leaving the tree on all day, renting Christmas movies (can you say Home Alone 2: Lost in New York?! ), playing holiday tunes for background music, and adding some new lighting to the family room to help create the perfect atmosphere. 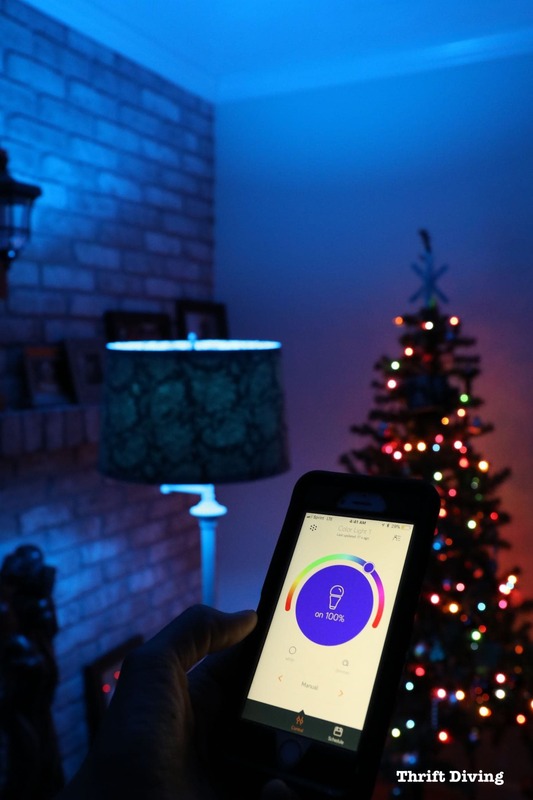 The Hive Active Light Color-Changing bulb works just like the other Hive Active Light bulbs I have told you about in previous posts: you screw them in, they connect to the Hive hub, and you can control them (OFF/ON and dimmer) via the Hive app for mobile devices (iTunes App Store or Google Play). Only, this bulb actually changes colors! Hard to believe, but it has over 16 million colors that can create any atmosphere you’re looking for, particularly for the holiday season or for anytime, really. 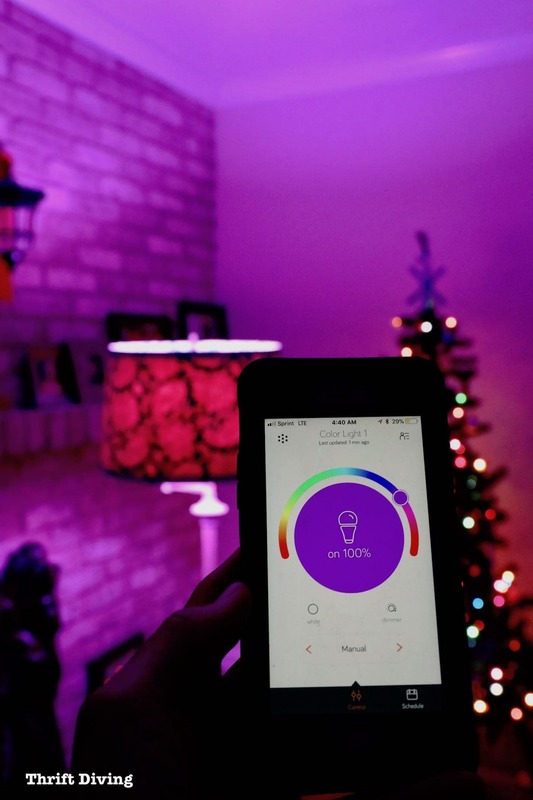 One of my favorite colors to switch the bulb to is purple using the Hive app! 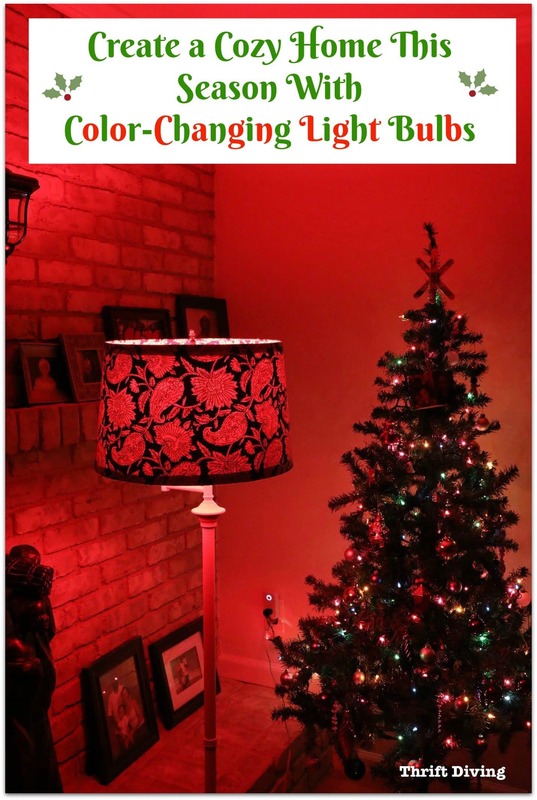 Just slide it along the spectrum of colors and the bulb changes to whatever color your mood or occasion. It’s pretty fun, actually! Yes, there’s even turquoise (my favorite color!) – gasp! And within the app, I can schedule the color-changing light to come on and off whatever time I choose, in whichever color I want. It also has the option to be set to a cool or a warm basic white color. Thankfully, you can choose from several different add-on products to any pack. I’ll need to get more of these bulbs! Last night I was so exhausted from all the traveling, lack of sleep from sleeping in a foreign bed, that I fell asleep early. I didn’t even think to check the tree to make sure the lights were turned off. This morning when I came downstairs early, to my dismay, the tree lights were still on! Christmas lights are pretty safe, but I still don’t like the idea of leaving lights on unattended. I grabbed my Hive Active Plug (which I had been using in the basement for my space heater) and plugged my tree into it. 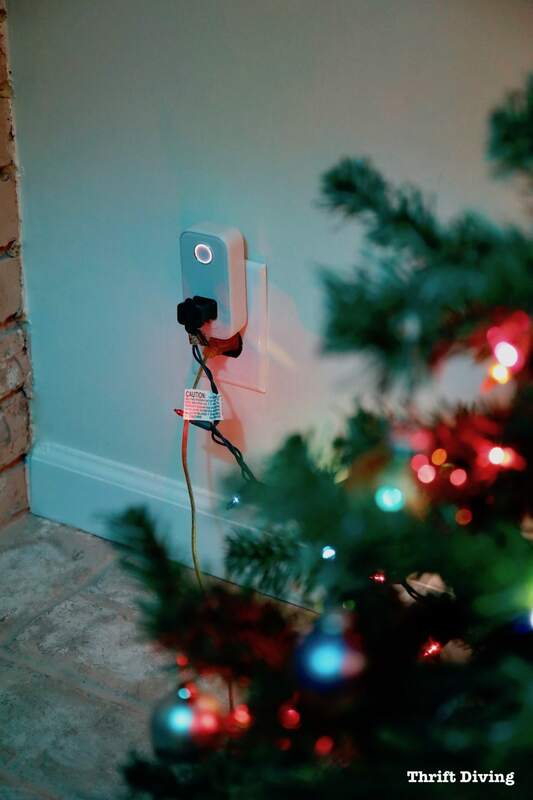 The plug will allow me to turn the tree on and off remotely via the Hive app, along with setting the tree on a schedule so that it comes on at a certain time and will go off at bedtime! Now there shouldn’t be any question of whether I turned off the lights–I’ll only need to schedule it! Plus, I can manually turn the tree off and on via the app if I want to change it outside of the normally scheduled hours. I’m super excited to tell you that from the time I first starting talking about the Hive smart devices, they’ve since changed their pricing structure and now allow you to purchase the devices upfront! Some folks didn’t like that the old plans required you to pay monthly. But now, both options are available. Of course, paying upfront is always ideal, but if you can’t swing a full payment upfront, you can spread the payments out over 24 months and will get all the features, warranties, and customer service. Click here to pick the pack that’s right for you. 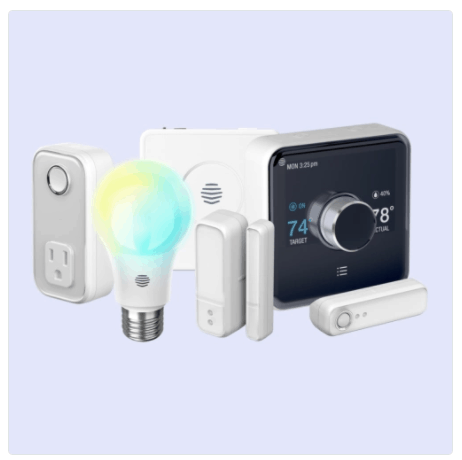 I’ve been using most of these items in the Hive Welcome Home Pack and I love the Hive Active Lights and the Hive Active Plugs the most. They’re so easy to set up, schedule when I want them on and off, and then just leave them. If I want to manually set them or turn them off and on while away from home, I can easily do it with the app. 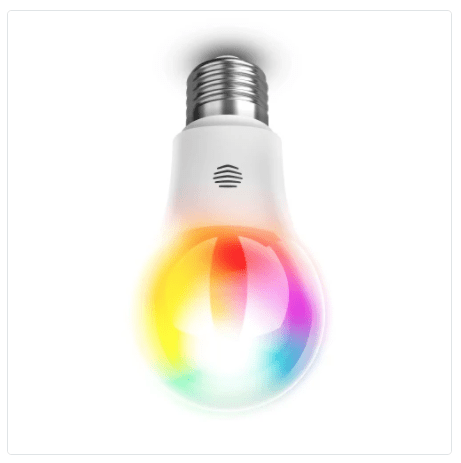 And now that I’ve got one of these color-changing Hive Active Light Color-Changing bulbs, I can’t wait to play around with it more! The kids are excited about it, too! No matter what you celebrate, this season is for getting cozy and spending lots of relaxed time with the family. 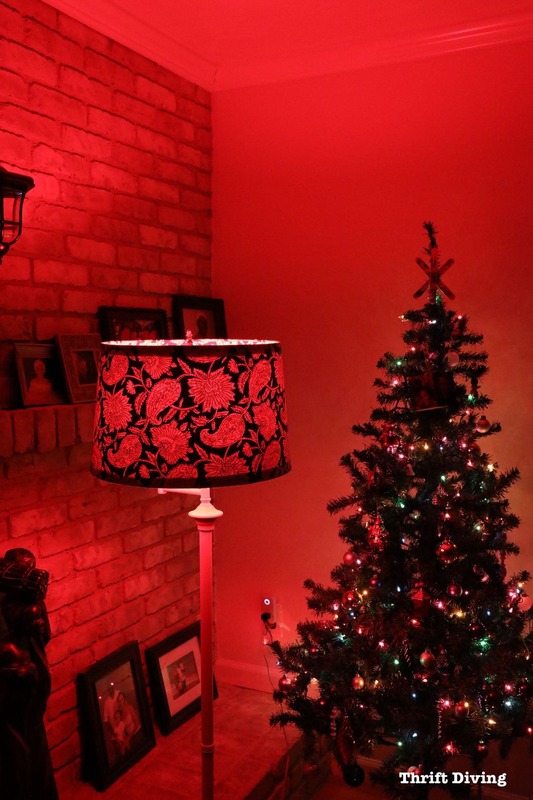 Part of achieving that relaxed and cozy-time is by creating the right atmosphere with the right lighting–whether it’s with a Christmas tree, lamps, etc.–it’s about setting the mood. And I’ll know that at 4 p.m. until 9:30 p.m., our Christmas tree lights and color-changing light (and other Hive Active Light) will go off on their own. Who Cares That My Ornaments Are Thrifted? 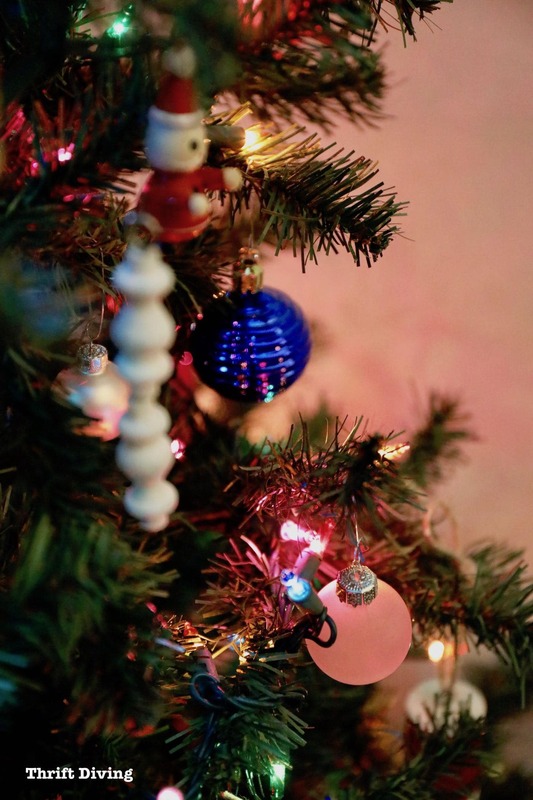 What matters most is that our house starts to feel cozy and that my family and friends enjoy this special time of year when things feel happier, merry, and more relaxed. « I Found the Coolest Vintage Building Sign Letters…for FREE! Home must be sweet and cozy. This is the dream of each and every individual. Thank you for the post. After reading your post i got some ideas to replenish my home sweet home.